My suitcase sits by the washer mounded with dirty laundry and my husband forlornly admits that he’s eaten all the pot pies in the freezer. I’ve been on the road too long and must attend to the homefront today so I’ll make the Synergy wrap-up brief. The two presentations that Judy Belcher and I gave at the conference (How to How to and The View from Higher Ground) are available. Keynote speaker Harriete Estell Berman has posted the handout listing references from her speech, The Good, The Bad and the Ugly in the Age of the Internet. Her talk evaluates the good of the Internet, some bad trends, and a few ugly behaviors that threaten the healthy growth of crafts.You can follow Harriete’s entire slideshow here. Other presentations will soon be up on the IPCA site. I am most grateful that I did not catch the cold that ran rampant through the stressed and sleepless crowd. 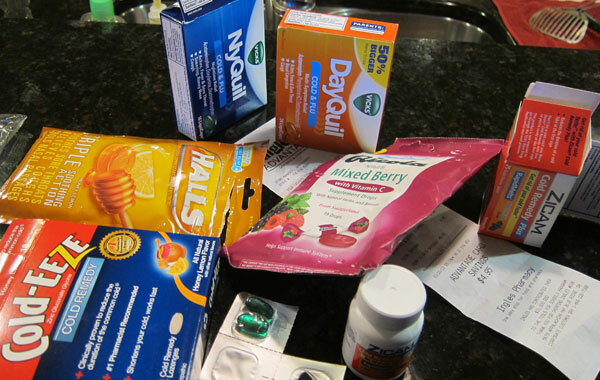 This snapshot shows the pile of therapies on my Georgia friends’ kitchen counter. Thanks to the IPCA committees that soldiered through sniffles and snafus to bring us Synergy3. Heartfelt thanks to all of you who donated your money and good wishes to the Samunnat building project for the ladies in Nepal. By the end of Synergy you had exceeded the goal. We’ll follow along as Samunnat realizes the dream and I’ll share pictures right here as the building goes up. We are over the moon with gratitude and the ladies are astonished at the generosity of their friends a world away. Thank you, thank you. 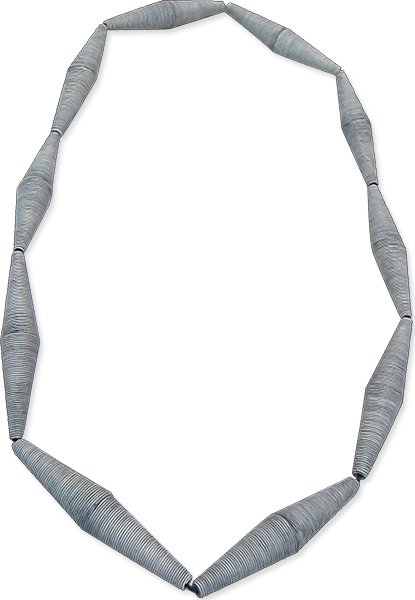 This black and white necklace from the UK’s Angela Garrod was in the Synergy gallery and I couldn’t get the idea of its extrusion-wrapped cones out of my head so I’ll leave it with you this weekend. My first Synergy was amazing. Meeting you and all of the fine artists and pioneers of polymer was inspirational. And loads of fun! Well done and thank you. I`m big fan on Angela Garrod great works!And this is one of them! Cynthia,thank you so much for sharing this presentations!Thus for a while and I was at the conference :-).Today will read them all three in detail,will be very interesting and curious.Also will looking for presentations of Anke Humpert,Christine Dumont and others. I spent the necessary time to listen to Harriete’s conference as i’m a great fan of Sergio Leone and his “The Good, The Bad and the Ugly”… no surprise in the content, and sadly i will add : lots of dreams as from majority point of view “sharing our work” authorize copying, and consequently it erases our presence on the internet as hard workers are less present on the scene than copycats, it is mathematical, more work to create, less time to publish. Sad humor, but i will look at other links with joy, thank you for sharing quality thoughts for the weekend!! Thanks Cynthia and Judy For the Presentations and Inspirations. Everyday the thought goes through my mind ” How to I take do I take the flying leap from being a Workaholic restaurant Manager and more than full time Show Dogs Owner. – TO – A full time starving polymer clay artist. The latter looks more inviting every day. I too am playing catch up on the home front after tons of fun at S3 (I didn’t get the S3 virus thank goodness). Getting laundry done today and then getting ready for the disaster (aka hot water heater blow out) repairs to start. Pod tomorrow, pack out team on Monday (buh bye kitchen and garage) and then the mold remediation and repair. gonna be a fun month. ayup! Love your quick update!! Angela’s work is classic and precise – it boggles my mind. Thank you Cynthia for sharing parts of S3 for those of us that couldn’t be there in person. So glad to hear the virus missed some of you. Really good news on the Summunat ladies! Interesting and thought=provoking keynote address—having had some personal experience with the issues of plagiarism, I am hopefully noting that so far, I have had the good fortune to find that the polymer community is pretty vigilant and protective of its own–and I do hope that trend continues. For her other points, there are many many grey areas–as we are increasingly exposed to the works of others, we may not even recognize when our work derives from something we’ve seen but do not clearly recall–none of us, after all, create in a vacuum. For example, if I do a piece that features black and white contrast stripes, am I plagiarizing Donna Kato? But I do agree it’s worth the effort to cite when you know your source! Thanks so much for the wrap up since I couldn’t go myself! I really enjoyed listening to Harriete’s presentation while I worked this morning. Much needed information, very well articulated! And I’m thrilled that Summunat’s goal has been reached – it will be great to watch them build from afar! Wow. What a lot of valuable information in a small space! I can see that you worked hard on it. I wish I could have been there. Such a moral booster and motivator. You’re so gracious and generous to give us links to your and Judy Belcher’s presentations. I just had a fun 30 minutes scrolling through them, knowing the whole time that the accompanying commentary must have been captivating. I learned a lot. And I’m not done yet – I still gotta check out Ms. Berman’s posts. You keep us all on our feet. And we’re all cheering. Thank you! Thank you, Cynthia, for sharing the links and the reports. It must be amazing to attend something like Synergy. I was tickled to death to see my Stroppel cane pendant in your presentation! What a great example of a fun technique going in all sorts of directions! Thank you so much Cynthia for higlighting my spiral shells necklace. Quite a few people were intrigued as to its construction. Synergy was also for me my first time there. I didn’t quite know what to expect. But what an incredibly inspiring event this was. Seeing all that great art of so many talented artists will stay with me for a long time. I must thank you all for the welcome we received and also of how approachable and friendly everyone has been. Many new friendships have been formed and many online friends were finally met in person. Thank you also to all the organisers for a memorable event and Karen. Last but not least a great thanks go to Dan and Tracy. A workshop not to be missed by any aspiring polymer Clay artist. We had fun, we learned and I shall definately return. Wonderful post! I look forward to reading the presentations, and have just listened to Harriete’s talk – very true and thought-provoking. Thank you!